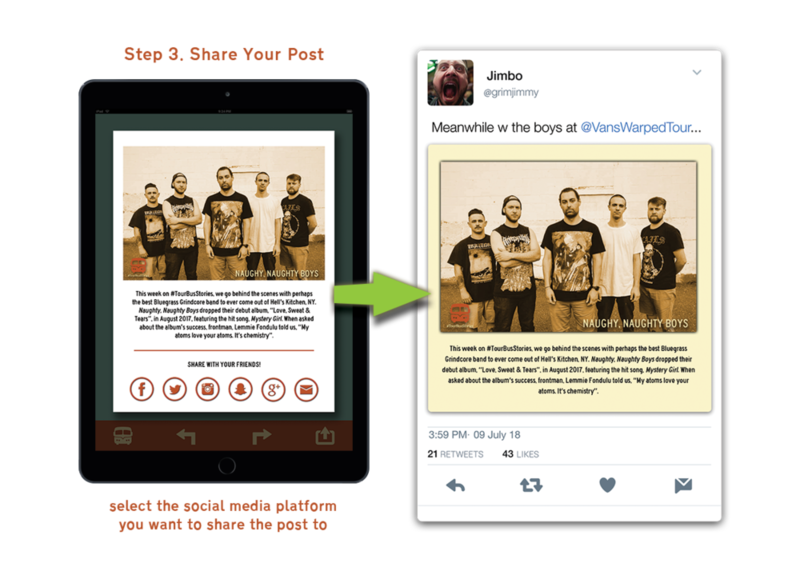 Tourbus is a new app that will evolve the way local music scenes organize and communicate. This tool allows organizers and artists to coordinate the entire agenda of an event all in one virtual platform. No more digging in texts. No more relying on social media event pages. No more last minute phone calls. No more congested group chats. 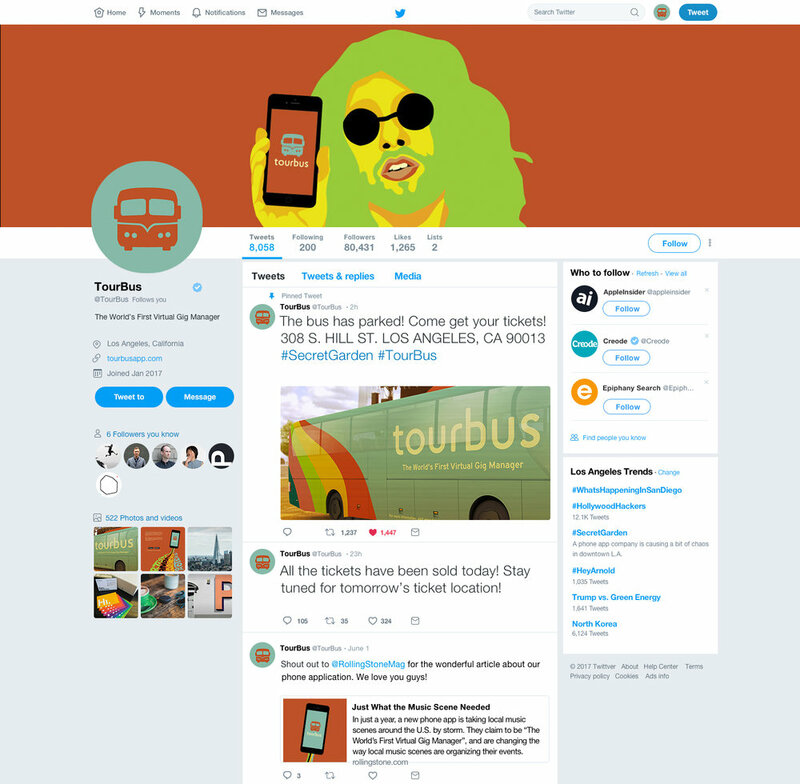 Tourbus offers performers and organizers a digital space to share, detached from the loud and distracting environment within social media. There are other apps out there that help you organize your show details and personal notes, but nothing that gives you the shared environment that Tourbus offers. Quality communication is the key to any successful event, and Tourbus gives you that key. 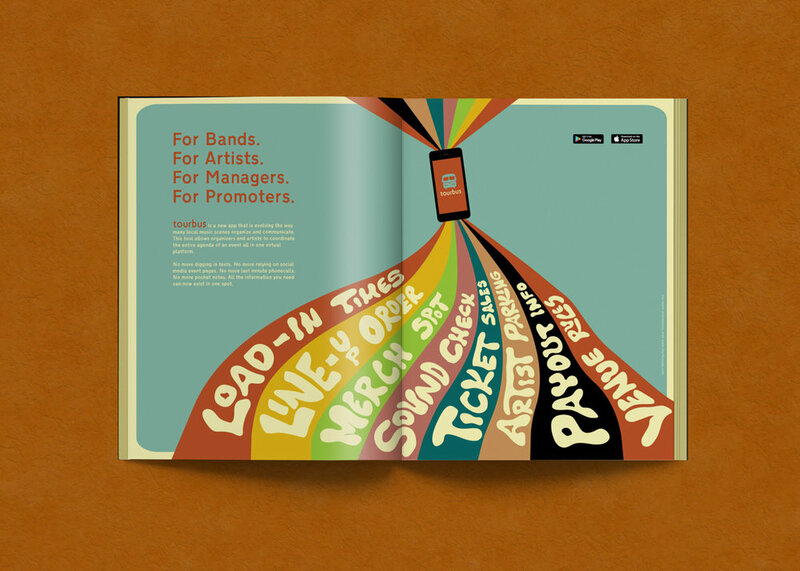 The top priority of this campaign was to appeal to musicians and organizers in the underground music community. To achieve this successfully, a certain aura needed to be established with the visual language. An aura communicating a down-to-earth professionalism. 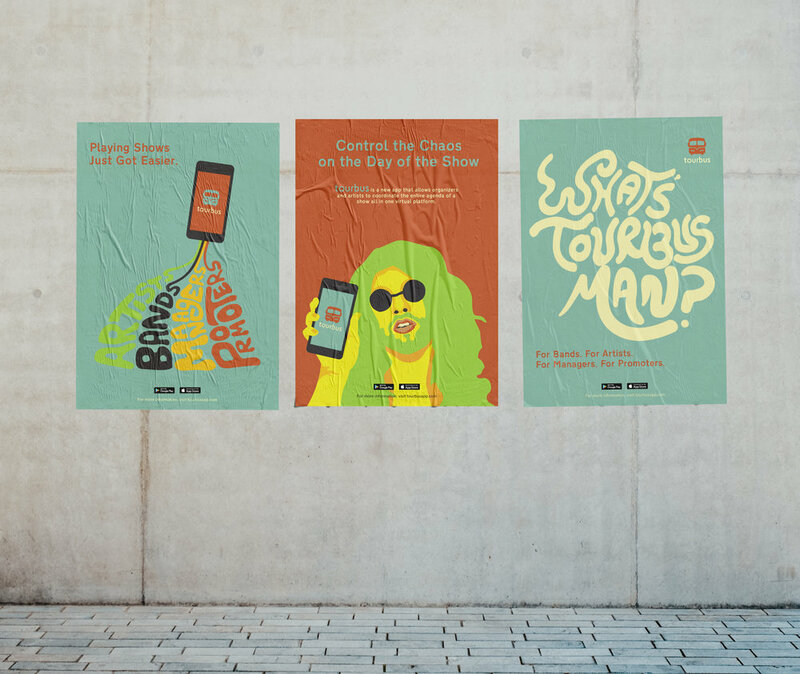 Taking heavy influence from sixties concert posters, coupled with the minimalist visual language in app culture, I developed the following ad campaign. The campaign spreads across five platforms, including print, indoor & outdoor advertising, video and social media. Considering our target market, there are going to be particular physical publications that I want to focus on. 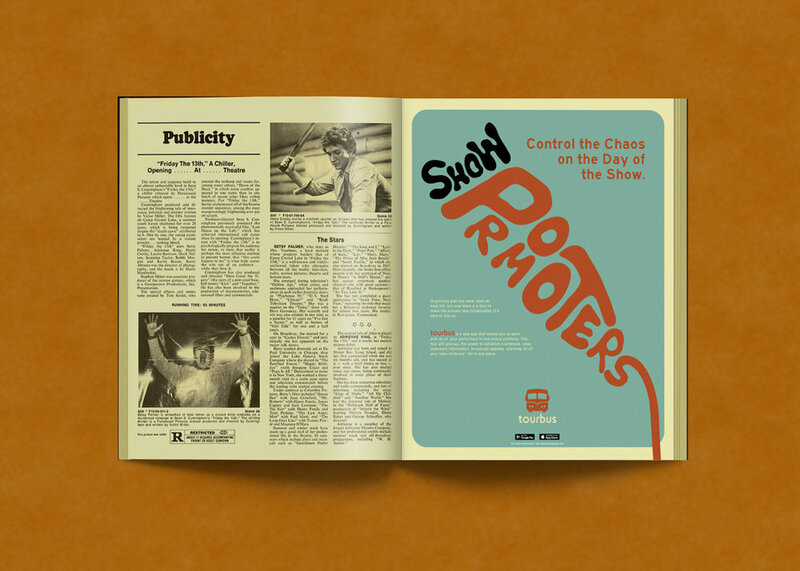 These ad mockups are intended for alternative Newspapers like the Twin Cities City Pages or Eau Claire’s Volume One, which are very popular amongst local artists and the music community. Other appropriate publications are Metal Hammer, Rolling Stone, KERRANG!, The Wire, etc. When you are looking for an indoor environment, with a big audience, filled with people who are involved in music, what better place to pick than a venue? Our indoor campaign will interact with the crowd through a giant projector screen that comes down in front of the stage in between sets. This is the perfect time to expose the TourBus brand, because the audience is already looking to the stage attentively, waiting for the next performers to begin. etc. What better way to engage the audience, than to let them take the steering wheel? In this activity, the projected display gives the audience a chance to show up on a live Twitter feed. In order to participate, they will need to tweet at the TourBus twitter tag, accompanied by the hashtag provided on the display. In this case it is #HouseHoldApplianceHorrorMovie. The user will then write an original joke with the prompt given by the hashtag (ex. Tempurpedic Exorcism). Can we really call ourselves TourBus if we don’t have an actual tourbus? When interacting with the outside world, this bus will be an essential part of the TourBus experience. Where TourBus goes, the bus goes. The bus will also serve as a festival mobile station, with a full expandable deck, where different activities will take place depending what event it is visiting. 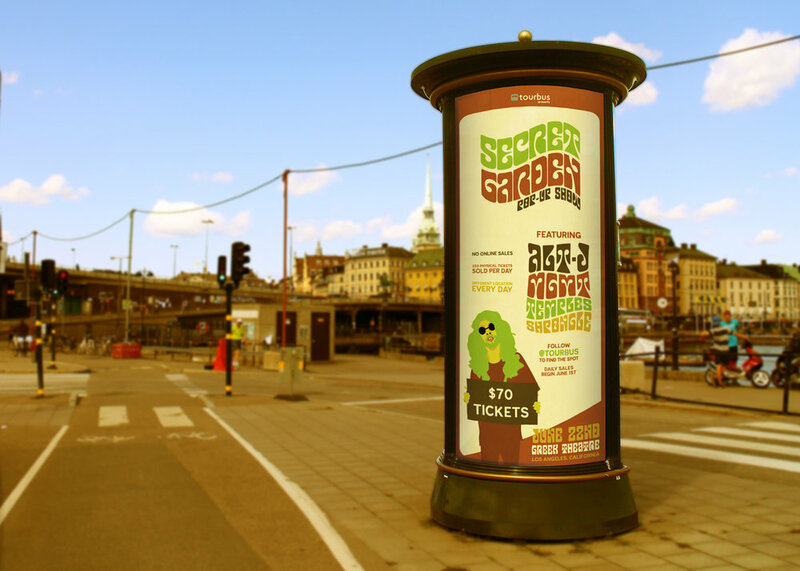 Music Festivals have become a goldmine for advertising. You’ve got thousands of young adults condensed into one area, traveling in groups looking to experience everything they can. The combination of a music festival audience and their heightened craving to share everything on social media makes for the perfect marketing recipe. The key is to give them an experience that is worth sharing online, and that is exactly what this mobile station offers. With these green screen studio setups, friend groups are able to take a “band photo”. From there, on an ipad, they will be able to choose a backdrop from a selection of different environments. After this, they will fill in answers to a few simple questions about their “successful band”. After the blanks are filled, a #TourBusStories post will be generated, with the group photo and the band bio below. Aside from being a musician’s favorite app, TourBus will also put on a bi-annual show, entitled Secret Garden. Aside from featuring huge artists, this event is distinctively special for a few reasons. Secret Garden tickets are NOT sold online. Five thousand physical tickets will be sold over a span of twenty days prior to the show, at a daily cap of 250 tickets per day. The physical tickets will be sold directly from the TourBus mobile station, but the location of the bus changes every day. In order to locate the bus, and get there before the daily ticket cap is reached, users will have to follow TourBus on social media and wait for the location to be released. The combination of social media interaction fused with the scarcity and exclusivity of this campaign is bound to create the perfect storm of hype and brand exposure. There may be potential to work with local radio stations as well. This marketing strategy was inspired by Chance the Rapper's publicity stunts in Chicago handing out free tickets. He communicated through twitter with his fans where he would be and people had to find him.